NSA has been a major force protecting practitioners for more than 74 years! NSA constantly monitors developments at the Internal Revenue Service and serves as your eyes and ears inside the IRS. Through regular meetings with IRS officials, NSA works to influence IRS practice, procedure and operations to promote the interests of practitioners and your clients. You can play a major role in this work by keeping NSA apprised of problems you experience in dealing with the IRS. 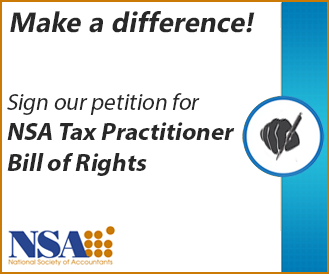 NSA is the leading organization protecting and enhancing the practice rights of small business accountants. At the federal level, NSA lobbies the U.S. Congress and federal agencies to support legislation to improve the tax code, lessen regulatory burdens and promote the interests of small practitioners and their clients. The Grandfather of Check the Box. This privilege is now available because of the tireless work and dedication of NSA members. If You’re an EA, You Can Thank NSA! NSA fought to allow accountants and tax preparers to sit for the Enrollment exam. Another NSA initiative was the creation of the title Enrolled Agent. PTIN. NSA led the initiative to have preparers’ Social Security numbers removed from tax returns, protecting you from identity theft and other misuses of preparer information. Tax Practitioners Bill of Rights. NSA issued a Tax Practitioners Bill of Rights to establish timely enactment of tax laws and regulations and reasonable levels of IRS service for tax practitioners, who file 60 percent of the tax returns received by the IRS each year. IRS Mission. NSA persuaded Congress to change the IRS mission to one of service to the taxpayer. E-Filing. NSA worked to eliminate the e-filing paperwork nightmare in advocating the use of electronic PIN numbers. NSA continues to advocate the streamlining of the e-filing process to further assist time-constrained tax preparers. Circular 230. Circular 230 currently gives limited practice rights to preparers who are not attorneys, CPAs or enrolled agents only if the preparers are participant in the IRS Annual Filing Season Program. Limited practice rights means they can represent clients whose returns they prepared and signed before revenue agents, customer service representatives, and similar IRS employees, including the Taxpayer Advocate Service. NSA led the fight to ensure that preparers who have earned credentials from the Accreditation Council for Accountancy and Taxation are recognized as tax professionals by the AFSP program and are exempt from taking the AFSP annual examination. Regulation of Tax Preparers. NSA continues to work to ensure that unscrupulous and incompetent practitioners are required to register with the IRS and be subject to the same rules, requirements and penalties as those practitioners who have always taken the time – and put in the effort – to be conscientious, knowledgeable and ethical. NSA is also working at the state level to ensure that local regulation does not impose new burdens and roadblocks to your practice rights, including state-specific fees and requirements that duplicate federal laws. Monitoring State Boards of Accountancy. NSA continues to monitor rules and regulation proposed by State Boards to ensure they are fair and not skewed to large firms. For example, in 2012 NSA was successful in overturning a proposal in California that would have required small business accountants to modify financial statements prepared for their clients by advertising the services of larger firms. These are just a few examples of the many long, hard-fought battles NSA has undertaken for your benefit. Join NSA today and help continue this important work on your behalf!